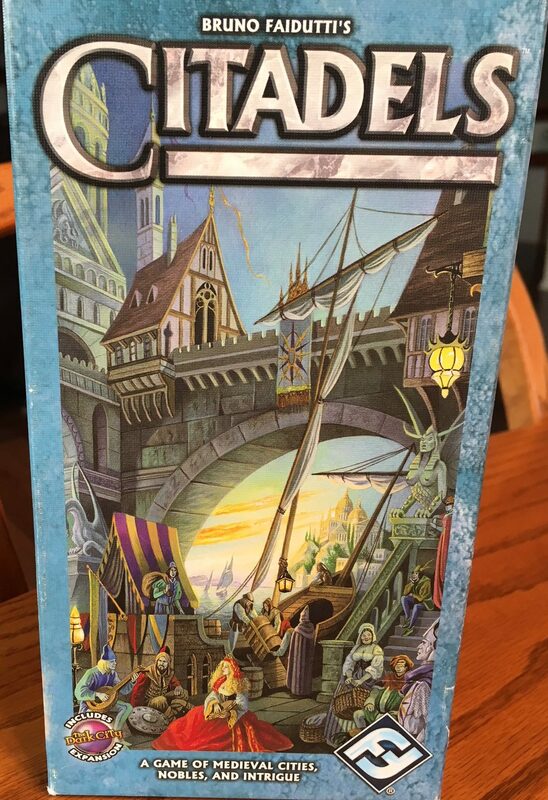 Citadels is an intriguing game of hidden roles and strategy. It takes place in a medieval era of nobles, merchants, and other influential characters. 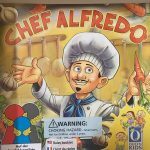 Nominated for the Spiel de Jahres in 2000, this game is notable for its social element of players using their wits to fool each other while racing to be the first one to build 8 city districts. This is one of my favorite games to play with a mid-size group because of its simplicity and social interaction. 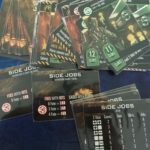 In this review, I will be evaluating the third edition released in 2004 by Fantasy Flight Games, which includes the Dark City Expansion. 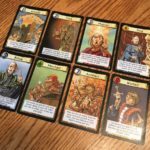 In Citadels, players are racing to build the biggest city. The game ends when a player completes their eighth district and whoever has the most points wins. At the beginning of the game, each player is dealt four district cards and two gold. The first player receives the crown and is given the character deck. 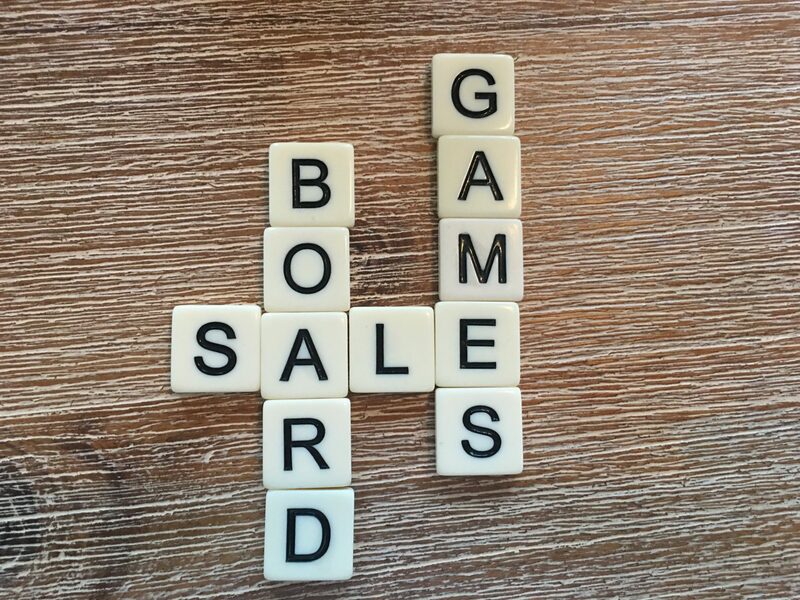 He will choose the character he wants to use this round—concealing the identity from the rest of the group—and hand the deck clockwise to the next player. That player will then choose the character she wants from what’s available and the same process continues until each player has a character. At that point, turns proceed in order corresponding with the numbers on the character cards. For example, the Assassin is #1 and whichever player has that character will take their turn first. On a player’s turn, they will take an action by either taking two gold from the bank or drawing two district cards from the deck and choosing one to keep in their hand. After that, they may build one district card from their hand. Also, they may use their character’s special ability at any point during their turn. Special abilities allow players to collect more coins, build an additional district, end other players turns, destroy other players districts, etc. Choosing your character is where bluffing and wits come into play. You want to choose a character that helps you, but is not the obvious choice that other players would assume you would pick. For example, if you have built all green districts, it would be to your disadvantage to choose the Merchant even though he earns you a lot of coins for all those districts. 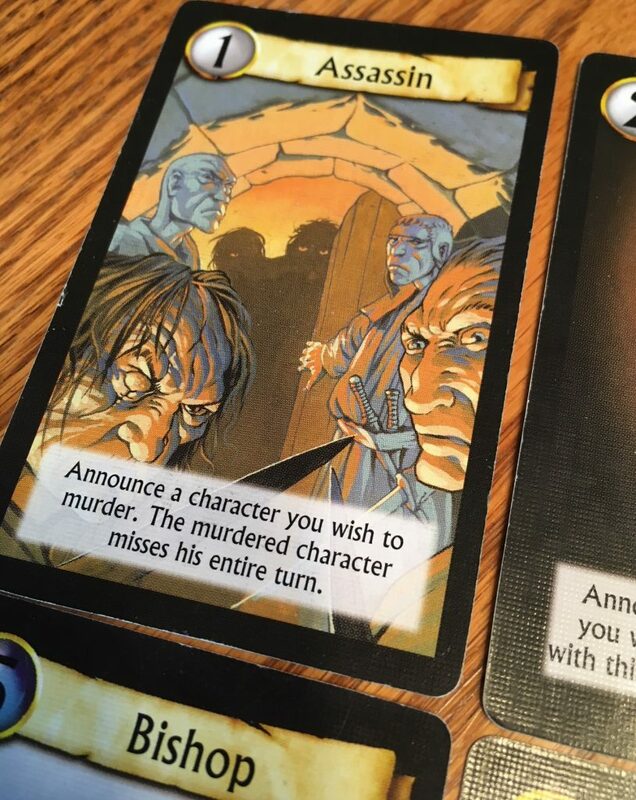 Another player seeing your districts would probably play as the Assassin and choose to assassinate the Merchant. This is the heart and soul of the game making for some intriguing interaction amongst players. 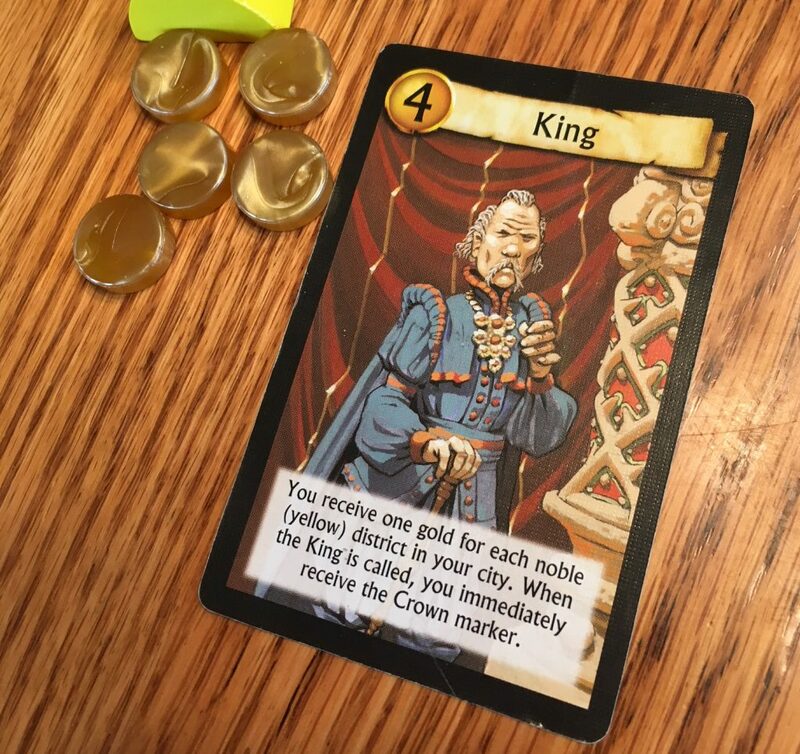 Once every player has taken their turn, the next round begins with the king receiving the crown and getting first choice of character cards. Rounds continue in this manner until someone has completed their eighth district. At that point everyone counts their points, which is equal to the total cost of all their completed districts. There are bonus points for building at least one district in each color and completing all eight districts. I love this game, but sadly it doesn’t get to the table often. Part of the reason is new players can get easily overwhelmed having to learn unique special abilities of eight different characters. I’ve played at various player counts from as low as 2 all the way to 7 players. It plays best at 4-6 because there are enough characters in play to keep things interesting, but any more than that tends to drag the game. I’ve played with the Dark City expansion a handful of times and I think it’s a great bonus to have included in this edition of the game. It involves new characters that are interchangeable with any characters from the base game as well as several new district cards. This is great for adding longevity and keeping the experience fresh. 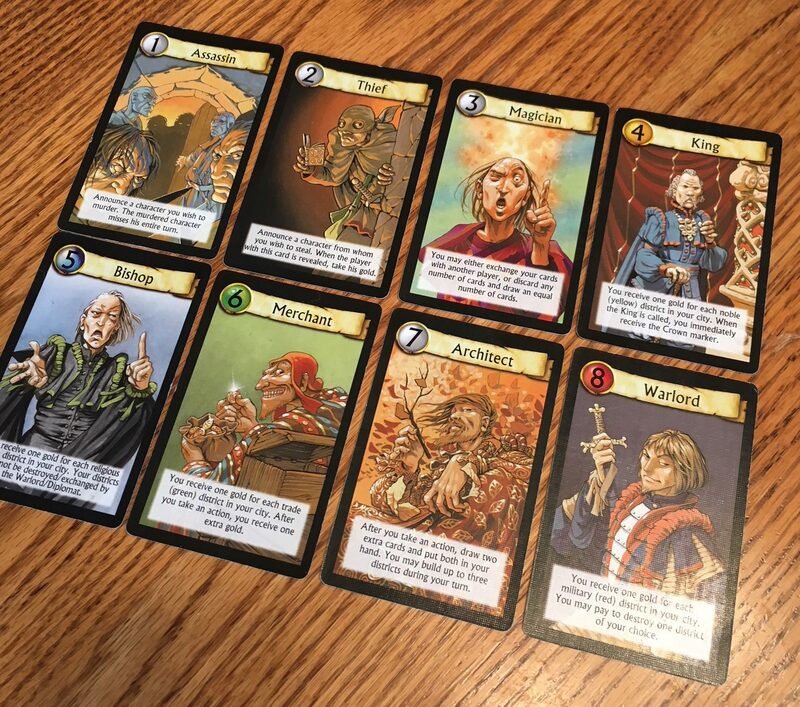 Citadels was one of the original games in my collection and the first game I ever got without having tested it out beforehand. What really drew me to it initially was the social deduction element mixed with the strategic race to construct all your districts. Also, I’m a sucker for Euro style games that scale beyond 5 players. It’s been eighteen years since its original release and the game has aged well due to it’s simplicity, yet tense decision-making involved. Especially as the game progresses, everyone has a good idea what other players are going for. You’re constantly thinking to yourself things like, “That player with one district left to construct will probably go for the Warlord so that he is immune to having his districts destroyed. But wait! Maybe he knows I know he wants that character. So, he’ll probably choose the Assassin instead so that no one can kill him.” I’m warning you, analysis paralysis can really do a number on players during those last few rounds as things heat up. Few games so wonderfully execute the mind games players play on themselves. But beyond that, it’s satisfying to construct a set of districts that earn you extra coins and other perks. 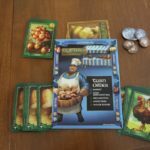 For me, it was almost like taking a social-deduction element from a game like Coup and combining it with an economic card drafting game like Machi Koro. My only complaint with the game is that it doesn’t scale well beyond 6. I so wish that I could enjoy it regularly with 8 people, but it takes just a bit too long. As is usually the case, for a game to successfully scale to high player counts, depth must be sacrificed. I like Citadels because there’s a bit of depth and it’s just plain fun to engage in a battle of wits.